When upgrading to Office 2007, be prepared to find a lot of changes in the layout. 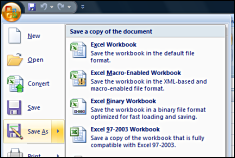 The Print and Save options are found by clicking the round button in the top left corner of Word, Excel, Access and PowerPoint. Other applications are basically as they were before. When you save a file, be sure to save as an Office 97 compatible file. For example, save as ".doc" or ".xls" instead of the defaults of ".docx" and ".xlsx". To make this task easier, you can change the default file-type. Office 2007 now groups commonly used items into categories that are easier to access from the main interface. For screenshots and more information, see www.it.umd.edu/resources/office2007-tips.html.